On the right side, below the Live Preview, you will see a test push form. Here is where you can send yourself or someone on your team a test push. On iOS, you can enter the IDFA or IDFA here, or toggle to send to a specific push token. On Android, the options are the Advertising ID or the device push token. If you receive an error when trying to send a test push, take note of the error reason and visit the Test Push Troubleshooting documentation to resolve. Once you’ve sent yourself a test push and reviewed your Campaign details, go ahead and activate your campaign. 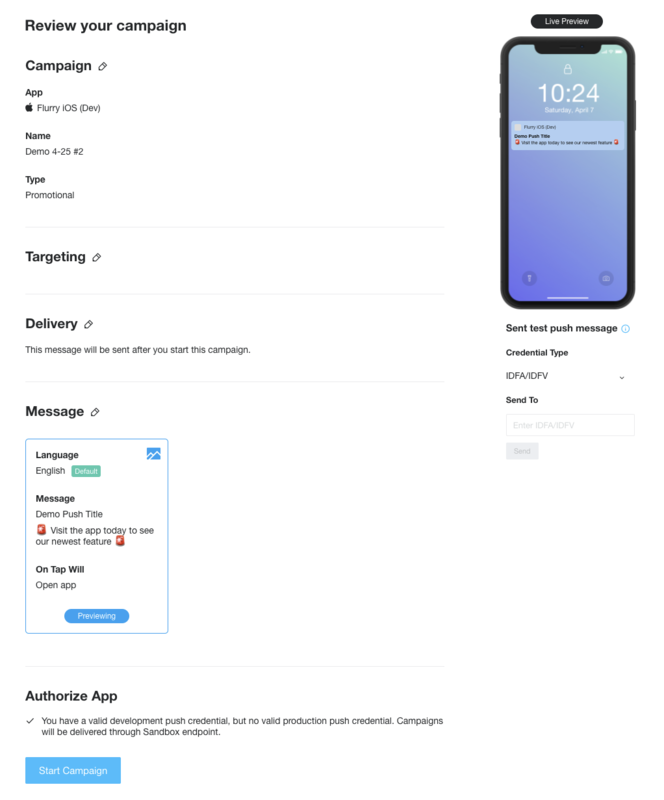 Note that if you are editing an active campaign, any changes made to Targeting, Delivery or the Message itself have already been implemented for the Campaign.